Q: What are the important deadlines for the 12-month Fellowship Program at the ELab? September 11: Workshop on expectations, requirements, and processes (ex: pitch decks). Q: Is the Elab an incubator? Yes, in part…Currently we are a distributed model of an incubator, where normally an incubator is a specific location where fellows meet up and work side-by-side; we meet up from time to time at our different partner spaces. We incubate startups in our various programs for different lengths of time, with different mentoring programming at different partner spaces that offer different opportunities depending on the sector. This is intended to give the startups a leg up by imbedding them in existing co-working spaces and incubators aimed at specific sectors to leverage their network and connections. Q: Who is eligible to apply to the Current Fellowship Programs at the ELab? A: Currently, only recent alumni 3 years out from graduating from the Design and Technology graduate program and from the four Parsons SDS graduate programs (Design and Urban Ecologies, Theories of Urban Practice, Transdisciplinary Design and Strategic Design and Management) are eligible to apply to our Fellowship Programs of the ELab. This means those who graduated in 2015, 2014 and 2013 can apply. The ELab 12-month Fellowship Program and its 3-month Summer Seats Program are both designed to target recent alumni. They do not support currently-enrolled students. However currently-enrolled students may attend specific workshops geared to gaining knowledge and skills that will guide them in their entrepreneurial journeys and eventually into the Elab! 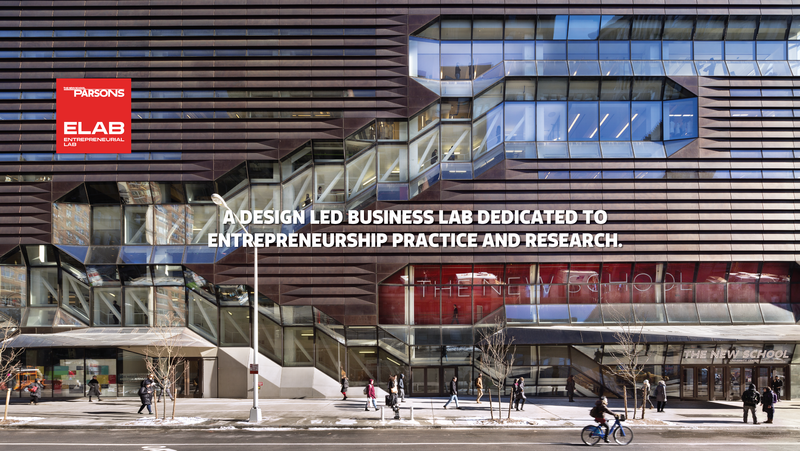 Q: Which ELab workshops am I eligible to attend as a currently-enrolled Parsons student? A: Workshops will be announced throughout the academic year that will introduce currently-enrolled students to the Fellowship Programs available upon graduation. These workshops will focus on different topics and skillsets needed. Not all workshops hosted by Elab will be open to current students. Q: Do you accept individual submissions or group project submissions? A: Yes both individuals and groups may apply. At least one primary (ie leadership) member of the team must meet the eligibility requirements and only one or two members of a team will receive seats. Q: What are the steps that you advise students to take in order to become eligible to apply for one of the entrepreneurial programs? A: The ELab highly advises students to attend the workshops that meet their academic level in order to maximize their potential for benefitting from the services offered by the Elab. The students may read about the programs on the website and learn about the eligibility criteria for applicants. Q; What are the criteria for applying and how do I prepare? We recommend you sign up for our newsletter and check our site often. This way you will get alerts and updates. Each program has a page with the list of criteria (link here). Students and recent alumni are expected to be passionate and follow instructions, build a pitch deck, compose a draft of a business plan develop a proof of concept (tested prototype with positive results) that illustrates the envisioned success strategy for the project. A: The criteria for each program are listed on the site and within each Call or RFP (Request For Proposal). In summary, the applicants need to be truly passionate and dedicated to their project, show entrepreneurial characteristics such as exhibiting characteristics of a leader and team player who is flexible and open to learning new skills, be adaptable and the projects need to show potential for success in the market. They need to submit a viable pitch deck and draft of a business plan that ideally includes a proof of concept or a tested prototype that shows promise. Q: How many fellows does the ELab intend to support every year? A: Depending on the year, the program offerings will differ according to partnerships and funding. Currently the Elab is running 2 programs: the 12-month Fellowship Program and the 3-month Summer Seats Program. Q: Will my business concept and application be kept confidential? A:. No, your project may be highlighted in our marketing and media around the Elab. Our aim is to give you traction, that means getting you out there. The ELab will work hard to constantly promote and market your business through its connections and network to help you succeed however if you have patentable IP, your intellectual property will remain confidential. Q: what is the ideal profile of a fellow? Q: What are the benefits of being a fellow? Q: What are the responsibilities and expectation of a fellow? Q: Do I incur any costs with the fellowship programs? Yes, currently the programs are subsidised by both the Elab and out partner spaces/incubator but you will have to have some skin in the game, so a small portion of the rent will be incurred by the fellows. Q: Who were the fellows of the first cycle of the Fellowship Program 2014/2015? Q: how many times a month do fellows meet with mentors? The frequency and duration of the meetings depend on the availability and need of the participants and will be discussed at the beginning of the pairing. Q: Can fellows select their mentors? A matchmaking software will soon assist the participant find the right match depending on their projects, goals and expectation. At the Elab we also value the importance of human interaction and we believe that it is key to the success of ventures, this is why both mentors and mentees will be able to have their input when selecting their matches. Q: How many mentors can a fellow have? Fellows can have more than one mentor if the mentors and fellows agree. Often they are based on expertise and needs. Q: What type of agreement do I sign if I enroll in one of the Fellowship Programs offered by the Elab? There are two contracts, one with the Elab and one with the Co-working space (lease). Q: How do I sponsor Parsons ELab? A: We are open to individual donors, corporate or foundations. Q: As an international recent alumni, how can I address my startup legal issues? Q: Students at The New School own their projects’ IPs, is it the same at the Elab? A: Yes Alumni how enter the Elab will still retain majority ownership of their IP and business but share a small percent with the Elab at The New School to hopefully help sustain the Elab for future generations of students.